Everyone counts, or no one counts. A few days ago my publishers relayed some feedback from a satisfied reader. She said she had enjoyed The Red Light Zone and had felt that my style of writing made it feel that my words were aimed directly at her, like I was telling my stories to just one person. Then, perhaps because she is a fan of the genre, she added that she wished I would write crime fiction. Oh, if only! These days I devour anything by Michael Connelly, especially the novels featuring Harry Bosch whose quest to seek justice for murder victims is driven by a simple yet powerful philosophy: everyone counts or no one counts. The Bosch TV show (a new series soon to be aired on Amazon Prime) is pretty good too. I’ll be binge watching that while the rest of the world is immersed in Game of Thrones. And so to Tom Morton, my friend and former colleague, who has just written a thought- provoking article about crime fiction in the latest Scottish Review. His musings were sparked by the recent Shetland TV series which is set, of course, on the islands that Tom has made his home for the past umpteen decades. He concludes his article by saying he finds it difficult to distance himself from the make-believe murder on the small screen when it seems so close to home. Perhaps that’s why I also avoid those hard-bitten tartan noir tales set in Glasgow. And could I ever turn my hand to crime fiction? I doubt it. Apart from anything else, there are too many good writers in that field and if you want some recommendations then you could do worse that read Mary Picken’s Live and Deadly blog, which has been nominated for an award. Or try some Manc Noir in the form of my friend David Nolan’s latest book Black Moss which begins in the same era of commercial radio as my own memoirs. 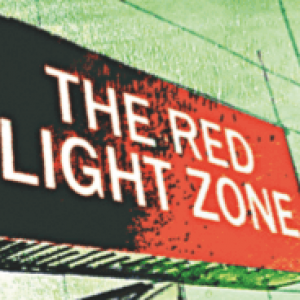 As for me, my slight and secret nod to the genre came in the Chapter Six of The Red Light Zone as I told the true story of a car chase in Los Angeles while we were out there broadcasting live editions of Tom Morton’s show from Hollywood. This was 1996 and our engineer, John Carmichael, took some of the VHS location footage which I’ve mangled and repurposed as the backdrop to this little extract. Next Post Don’t tell The Queen.